Some weeks ago, JavaFX links of the week contained a very interesting link: It was about ZoomFX 1.0.1. It's a zoomable pane for your JavaFX application. There's another small project, called MagniFiX. It's a "simple" magnifier but different than ZoomFX. Why was this so interesting for us? In the past we had a lot of requests from customers for automatic application scaling for simple touch devices (terminals). Usually we solved the problem with extra source code and specific fonts/control settings - horrible. So we thought that ZoomFX could be a very useful extension for our JavaFX UI. We tried the demo and configured a simple test application. But first: Maven. Not new: We aren't big fans. The overlays were saved as FXML and we thought that it's not a good idea for a library like ours. Anyway, we tried the integration in our lib and stopped suddenly because ZoomFX didn't work with our dynamic layouts. 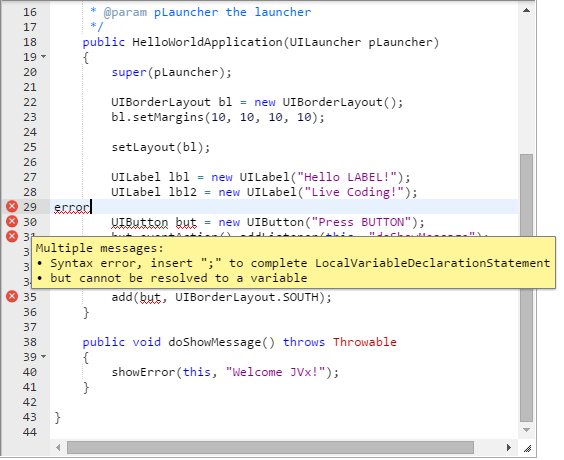 It simply didn't work out-of-the-box and it had too many dependencies for such a "simple" feature. We had no luck... but we love researching new things. So we started with our own zoom implementation without any dependencies and also integrated in our UI. We made a short screencast of the result. Every application and internal frame has this zoom feature because it was integrated in the UI implementation. We need to do some fine tuning, but it works great! The release is two weeks later than planned but we had some extra tasks to do. We didn't set 1.0 as version number because we have some open tickets which are important, in our opinion, for 1.0. The 0.9 beta is already feature complete with some known bugs. It contains all standalone controls and extensions which are independent of JVx. The MDI system, our layouts, styled scene and much more. All libraries are available on maven central as well. We've released DnDTabPane as external lib on maven central, because it wasn't available and our UI needs the dependency. The DnDTabPane is licensed under EPL 1.0 and JVxFX UI, JFXtensions are Apache 2.0 licensed. The DnDTabPane is still based on Tom Schindls implementation for Efxclipse. The visualization was created with Gource. The dev2015 branch was merged back to trunk. If you're working with our branch, please switch to trunk. JavaFX doesn't define a specific model for table or tree. The implementations are based on ObservableList which is not more than an extension of standard List interface with some additional listeners and sorting, filtering. The general design doesn't take care of one important feature: Lazy loading of records. This is an important feature if you're working with databases or large datasets. If you have millions of records, it's not a good idea to show all records in your GUI. You shouldn't load more than needed and of course, not more than the user is able to handle. We have a model in our JVx framework which supports lazy loading of records (not only database records). To use our model with JavaFX, we had to do some Trial and Error because an ObservableList is too lightweight. Sure it wasn't a problem to simulate more entries than the list really had. This was needed to load records on demand. If a "virtual" element was requested it was simply loaded from the datasource. Sounds simple enough. To be honest - it was that simple! A bigger problem was the scrollbar handling of the controls because it didn't set the scrollhandle position correctly after loading "virtual" records. We didn't find a perfect solution for this problem but our current solution works and is user-friendly enough. We've used our JVx model implementation for TableView and TreeView. Means: One model for all UI controls. A simple screencast of our test application is available on YouTube. The video shows a simple TableView which loads records from a remote server via http. The remote server reads data from a HSQLDB. 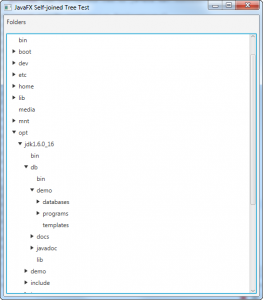 The table contains 317027 records with filenames and additional filesystem information. The remote server returns exactly 100 records, per request, for our test application. We have the same lazy loading mechanism for TreeView. Our implementation was done for JVx' model (IDataBook), but the mechanism should work with any other model definition. The complete source code is available in our dev repository. Simply start with ObservableDataBookList. Trees are always tricky, because it's not easy to fill a tree with data. The problem is not the tree itself, but the preparation of data for the three. It's easy if your data is structured or if you have only few records to prepare. If you have differnet datasources, it could be very tricky to build a tree. The official tree documentation from Oracle has some examples. It's boring to create trees because it needs a lot of boilerplate code - per tree. You need more boilerplate code if your trees should be editable. 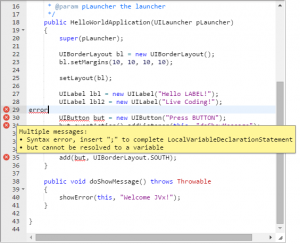 We solved the "boilerplate code problem" with JVx and the active model implementation. I'll show you a simple example with a self-joined database table. 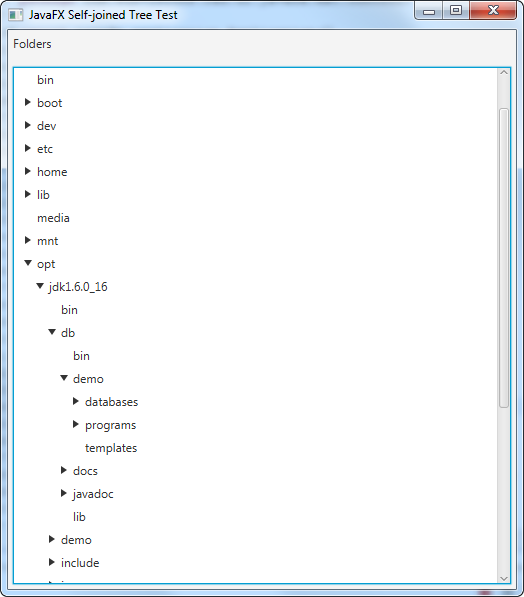 The database table contains all filesystem folders of our Linux test VM. Not really tricky. The table contains an unique identifier, the folder name and the identifier of the parent folder. A simple self-joined table. Short and no boilerplate code! The code is similar to other examples likeJavaFX, JVx and data binding or Plain JDBC vs. DBStorage. The whole source code is available in our dev branch. An example with a MemDataBook is available in our kitchensink application.